No, Really. You're Making It All Up. - Better Believe It! News No, Really. You're Making It All Up. You can never know reality because you project the world “out there” and you see what you want to see. I’m sure you’ve heard that idea stated in different ways at various times in your life. Most people take it at face value and immediately think, “Yeah right. I know better. Go jump off a cliff”. 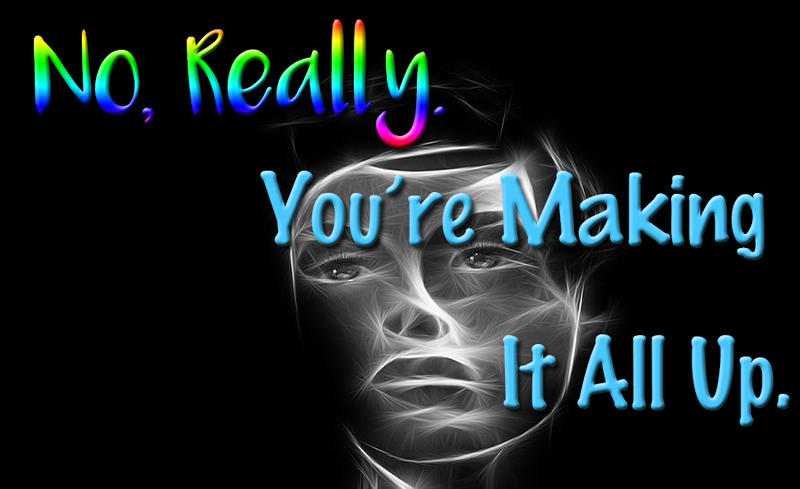 But what if it’s true that you’re just making it all up? 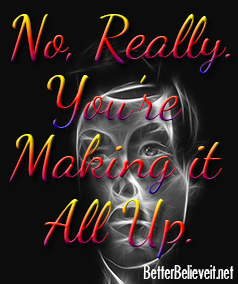 What do people mean when they say that you’re just making it all up? At first glance, it seems absurd. I’m walking into this office building. I did not make up the existence of this building. Strangers are coming and going from this building. I push the elevator button, and soon an elevator appears, as it has done in countless other buildings I’ve been in. All the people here seem to see the building and experience it as I do, right? I’ve seen the building’s picture in a magazine, and the picture looks exactly like how I see it. Surely it looks the same to me as it does to others. Any strange odors are sensed in a similar way by other people near me. No one would argue that the wall feels hard and strong. The same goes for everything else I encounter in the world every day. However, you can only experience anyone or anything by what comes in through your five senses, and before your brain registers any of the sensory data coming in through your receptors, it first filters it through your memories, experiences, thoughts, beliefs, and feelings. Only then does it “make sense” out of the incoming data where it can then organize it and store it. 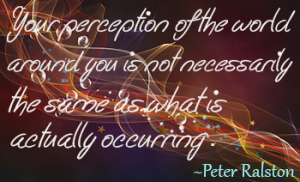 Everything is perception. Well, duh! Everyone knows that, right? Based on my experience, I’d have to say “no”. Maybe they know it, but they often fail to delve deeply and see how profoundly affects every aspect of each of our lives. Often, it’s not apparent that what we see, hear, feel, touch, or taste is a filtered experience. The opinions we hold about the people we know are just opinions that are based on the stories we tell ourselves about that person. Those stories are based on our past experiences (and the stories we made up about those), the focus of our awareness, the assumptions we make about what that person thinks or why (we believe) he acted a certain way. It’s all made up by us in our minds. Your perception of a person, place or thing is colored by your mood at the time, as well. Every bit of sensory data you experience is filtered in this way. 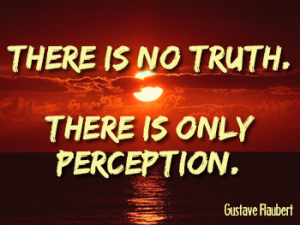 The problem is that people believe their perceptions are absolutely factual and correct. However, if you look and see how much you’re making it all up, you can find the biggest personal freedom there is – the power of choice. The fact that you’re making it up gives you a wondrous freedom. If you don’t like something, you can “make it up” in a different way – a way that makes you happier, more peaceful, balanced, loving, etc. If you look and contemplate, you will see how much of every situation, every person, every experience you have in a day is simply one tiny opinion (out of the many, many possibilities). It’s not an unalterable “fact”. As an example, a lot of what causes stress or inner conflict in people’s lives has to do with the other people in their lives (or so they think). We get our feathers ruffled by our spouse, our children, or co-workers, our friends, the “rude” cashier at the corner store, etc. We get angry or sad or frustrated, or we get happy because of someone else. I won’t cover the positive emotions, because if you think someone else has made you happy, well, there’s really no problem. (My thought is that no one can make you happy or sad or angry or anything else. You do that yourself). But to continue with the people example, I’ll use one of my own experiences to illustrate. The man I married did a lot of things that I felt caused me (and others) great pain. He kidnapped my kids and took them to a third world country, and as a result, they had to grow up without a mother near them. The absence of my kids affected me greatly. For a year, I could barely get out of bed. Seeing another parent with their child sent me into an emotional breakdown for a long time, so much so that I quit going to stores and places where I would encounter such experiences. When we were married, he hit me, and he hit my kids. He said mean and hateful things. I have a long list of why he is a “bad person” and why I am justified in hating him or being angry at him or all the other negative emotions. I did many things myself to generate the years of angst, turmoil, despair, pain, anger, and hatred I felt, emotions that impacted every area of my life for a long time. First, I focused on all the bad things he did. Seriously, I could not come up with one good quality in him. But you know what? There are people who like him. They see qualities I don’t even see. Everyone has good qualities and bad. What you notice and what you focus on forms part of your story – what you’re “making up”. Then I made lots of stories in my head, stories about why he acted a certain way (“He’s evil”, “He doesn’t care about anybody but himself”, etc). But how can we know why another person acts the way they do unless they explicitly tell us? We guess. We make up a story. We assume things. And the stories I made up caused me to feel hatred and a bunch of other feelings I didn’t want to feel. Also, there’s the fact that I am one tiny speck here in an enormous universe. From my perspective, I can’t see the whole picture. I see a tiny, tiny part of the whole. So how is what I see or believe or think an unalterable fact? It is not. Not only am I looking from a small vantage point in space, I am only seeing things from a tiny point in time. If I expand the time frame and look back on it 30 or 70 or however many years in the future, I might see it in a whole different way. Finally, my mood played a large part in how I saw him. He cut me off from friends and family, kept my mail from me, wouldn’t let me talk on the phone to friends, wouldn’t let me leave the house, etc. As a result, I grew despondent, often overwhelmed with feelings of loneliness, despair, depression, etc. So all the events that happened were colored by my already-present mood. How many times have you walked into a store in a bad mood and suddenly, everybody and everything gets on your nerves and bothers you? Was it the people and events? No. If you walked in feeling on top of the world, no one could bother you and you wouldn’t hang on to the thoughts and events that occurred there. They’d come and go and you wouldn’t think twice about it later. Let me explain what I mean when I say you “hang on to things and make a story about them”. Say you take a 30-minute drive in the country. As you drive, you pass countless trees, telephone poles, houses, etc. But you don’t focus on them. Instead, your body senses them (usually just sees them), but you don’t hold on to the thought or focus your attention there, so the thought quickly passes through and is forgotten. You don’t get to the end of your drive and say, “I passed so many oak trees and a lot of maples, too”. To hold onto something, you have to focus on it and make up a story about it. Say there was an old, interesting mansion you passed and it caught your attention. You focused on it, then you made a judgement (“What a beautiful piece of architecture that is. The owners should paint that and fix it up”). If you fulfill those requirements, chances are you’ll hang on to the thought so you can talk about it later. Sensory data floods you at all times. You choose what to focus on and keep around for later. Also understand how thoughts, beliefs, and expectations determine your reality. In 1909, Geoffrey Ingram Taylor proved this beyond a shadow of a doubt with an experiment called the double slit experiment. They found that the determining factor of the behavior of energy (‘particles’) at the quantum level is the awareness of the observer. For example: under the same conditions, sometimes electrons would act like particles, and then at other times they would switch to acting like waves, because it was completely dependent on what the observer expected was going to happen. 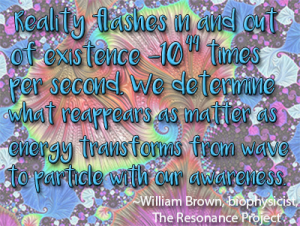 Whatever the observed believed would occur is what the quantum field did. The quantum world is waiting for us to make a decision so that it knows how to behave. That is why quantum physicists have such difficulties explaining the quantum world. We are truly, in every sense of the word, masters of creation because we decide what manifests out of the field of all-possibility and into form. Things happen. Oftentimes, you cannot change other people, events, or situations. You could spend years trying, just to end up exhausted and frustrated. But you do have the power to change how you experience the world around you, the thoughts you think, the beliefs you hold to be true, and the way you feel. Here’s some tips to get you started on a path to being happy, contented, peaceful, or loving, regardless of what happens “out there”. They say “Put 10 people in a room to watch an event, and you’ll get 10 different accounts of what happened”. It’s true. When things happen in your life, or people do things that “upset you”, sit back and know that you’re making it all up. And with that comes the tremendous power to choose a different framework – one that doesn’t make you upset. Everyone thinks, “I’m right”, but if you think instead, “This is one opinion out of many possibilities”, you have the power to create a better life. Change the thoughts you have. Neurolinguistic Programming (NLP) is big on teaching people how to choose the correct language to create harmony in your life. One simple example I learned about years ago when I was learning about NLP involves an alarm clock. When you think about the word alarm, what comes to mind? I think of negative things: ambulances and fire trucks rushing to some bad emergency up the road, a building alarm saying “Someone broke in! Danger!”, or when something bad or dangerous happens and someone feels “alarmed”. Each new day is a brand new opportunity for new and better things. The old is gone. Each new day provides you an opportunity to become a new person. New, exciting experiences are possible. You can learn new things and make better choices. So why call that thing that wakes you up to bring you into a new day an “alarm clock”? Why not, instead, call it an opportunity clock? Instead of being something you dread, something you hate to hear, you can re-frame it into something great – something that reminds you of all the wondrous opportunities awaiting for you when that sound goes off.That’s just a silly example, but the language you use does matter in helping shape your reality. Research NLP online or read The Big Book of NLP: 350+ Techniques, Patterns & Strategies of Neuro Linguistic Programming for tips and tricks you can use in your everyday life. Change the beliefs you harbor.That’s what this website is about, so no explanation needed. But pay attention to beliefs you harbor that affect how you see the world (“Husbands/Children/Bosses should be____” , “I am ______”). Change beliefs that hamper you rather than empower you. See How to change your beliefs. Eliminate the words “should” and “shouldn’t” from your internal vocabulary. In her book, Loving What Is, Byron Katie repeatedly states how useful it is to accept reality as it is. It’s fine to see something you want to change and then work to change it, but always accept what is first. Living with a bunch of “He should” or “they should” statements floating around in your head is a sure way to experience things negatively. Everything you sense gets filtered through your past memories, experiences, etc. Here’s a technique to re-frame your past events. Say you have a negative memory. When you think about it, all the negative emotions pop up again as you re-live it in your mind. So picture that event in your mind. If the image is in color, make it black and white. If the image is big, imagine yourself floating near the ceiling, looking down at that event occurring on a small TV screen in the corner of the room. Imagine a pleasing smell wafting over you as you view this event on that tiny, black-and-white TV screen (I would smell roses!). Play uplifting background music as you watch the event playing on that screen. Use as many senses as you can to re-frame the event in a way that makes it more positive and less negative for you. Work on it, and you can “take the sting out” of past events, people, and experiences so that they don’t add negativity to the new experiences you get to experience today.